Defending men’s champion Police showed that they mean business in this year’s McDonalds Coral Coast 7s. Police outclassed Dratabu 19-0 in their first match and thumped BLK 26-5 in their second match. Police will play the 2017 Coral Coast 7s champions, First Light Taveuni in their last pool match this hour. Police scored a total of 7 tries excluding their last pool match, with Livai Ikanikoda, Keponi Paul, Joni Tanoa and Mosese Baravilala getting one try each while Rusiate Matai scored two tries - one against Dratabu and the other against BLK. 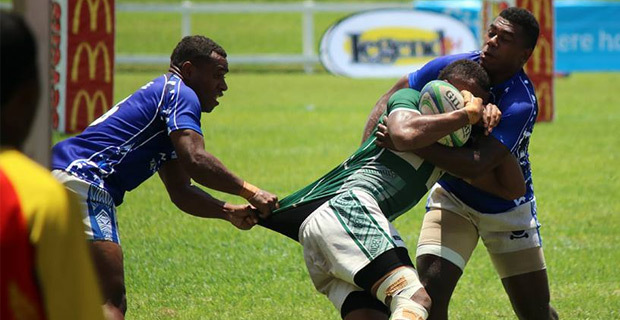 In other matches, First Light Taveuni defeated Dratabu 17-7, Sigatoka River Safari defeated Tabadamu 14-12, Hong Kong thrashed Lokalevu 20-5, Ratu Filise thrashed Suva Stallions 29-0 and Coastal Brothers drew with NFA 12 all. Meanwhile Fijiana Development has been crowned as the new Coral Coast 7s women’s champion after they defeated Marist Seahawks 1 22-5 in the final. They were leading 15-0 at half time. Marist Seahawks came back with a try from captain Roela Radiniyavuni in the second half but Fijiana Development answered with another try. Luisa Tisolo scored two tries while Litia Naiqato and Asinate Savu each got a try for Fijiana Development. Stars USA Women defeated Nadi Airport Aviators 21-12 in the plate final while Lautoka Crusaders took out the bowl title after defeating Outrigger Knights 17-10. You can catch the live commentaries of the quarter finals of the men’s competition from 11.20am, semifinals from 2.50pm and final from 5pm tomorrow on our sister station Viti FM 92.2FM, 92FM and 92.6FM.